How does Amish taxi driving work? From time to time we get this question from people interested in doing this job as a side business, or full-time gig. Generally speaking, an Amish taxi driver is simply anyone who is paid to drive the Amish. This typically means either local business trips, visits to family or community events, or on more distant journeys. Business Insider ran an article on this topic last year, which recently came across my radar. It’s written by Amanda Grossman, who had the job for a short period. It gives a nice level of detail for those curious. Her father has done the job full-time for over 14 years, with trips taking him around Pennsylvania and other locations in the US and Canada. Amanda helped out part-time one summer. She describes what the job is like from a financial and logistical perspective, along with some of the side benefits. First, what does taxi driving look like in practice? And for someone doing it full-time? An Amish person called one day and asked me if I had time to take him away. And he would pay me for it. It worked out. And, he happened to tell his brother about it. Word got out, and all of the sudden my phone rang and rang and rang. The article also discusses other costs and hurdles, such as typical repair costs, gas cost per mile, and insurance and registration requirements. Or the time I got to take a family down to their Englishmen friends in Baltimore. This led to driving into D.C. the next day and taking the Amish on their very first metro trip (and from the looks of the passengers, their very first sight at the Amish!). Amish population growth continues to be strong. And it’s unlikely Amish will accept operating vehicles en masse anytime soon. So “Amish taxi driver”is a job that will continue to be in demand. From my experience speaking with Amish, a good and reliable taxi driver (they don’t always turn out to be that way) is appreciated. I’m a driver in Lancaster County the Amish keep us hopping and we never have a dull moment, lol. Sounds like you enjoy it Debbie 🙂 I have only ever been a volunteer driver for Amish friends and acquaintances…though I can relate to the article writer’s comment that there are a bazillion little stops to make, but that never bothered me, and I can understand why they’d have a lot of stops to make if you’re not able to just pop out in the car anytime you need something like non-Amish are. Amish taxi driver near me? Mary this list is a bit dated (there’s supposed to be a fresh one next year), but you can see all the Amish locations in Illinois and potentially others that might be near you. If only I lived near enough to an Amish community for it to be worthwhile! I’ve often thought about how interesting it would be to drive the Amish around. Since I’m not likely to move anytime soon, alas, it’ll remain a dream…but I do like to read about the experiences of other Amish Taxi drivers! Thanks for including them, Erik. Wish it was as nice as described in Ohio. It’s not easy. This article is a few years old, possibly older. I think it’s a bit misleading (paywise) sorry, the Amish are thrifty. I could say more but choose not to. Good luck. I had stopped in unannounced at Amish friends in the Kingston settlement just to say hi. Shortly after I arrived a 15 passenger van pulled up and when the riders starting filing out, I started counting! It all happened so quickly my mind was spinning! Number 14 got out and that left the driver for #15. I was in the kitchen and the lady of the house stood by the door shaking hands as they came in. They looked at me and I wish I could have snuck out the back door! lol The visitors started grabbing the kitchen chairs as they trotted off to the living room and very shortly they had all found their perspective place to start the visiting process. I chatted with a couple men and said my goodbyes. Due to talking to Amish friends and reading the Budget for so many years this visit made perfect sense to me. They, the Amish, get a “load” together, plan the trip and their destinations, call the driver, get picked up and away they go! Depends on the distance as to the pickup time. Often I read 12:00 am as a start time. Well, when you have ?? miles to go with 15 stops to make, it’s a full day! Whew! Too bad we traded our Suburban in….it only held 8, so probably too small anyway. Sigh…. 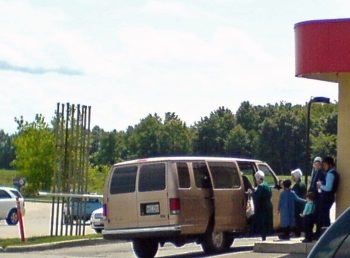 I have been driving for the people in the Amish community in the Belle Center and Rushsylvania areas in Ohio for 4 years now. I really enjoy it and I have made many new friends by doing so. They are wonderful people. Neat to hear that Jennie, we have often had posts and comments here from a member of the Belle Center community, Mark Curtis, and his late father, Don. I had a nice impression of the Belle Center community as well. Thank you, Eric! I truly appreciate you writing about the Amish taxie driver information. Great to see your heart is into your readers. I have been an Amish driver now for 14 months, best job ever.. I was only driving for 3 months and acquired a job driving school teachers to school everyday and then home in the evening. One hour and ten minutes in the morning same in the evening. Shorter runs in the day and my husband helps out getting the teachers if I do an all day run. I love the Amish and they are so appreciative of my time. Thank you for posting this great article. I was wondering, do you charge those rates per person, even though you may be driving 4-6 passengers?